On Wednesday, November 7, 2018, the Byron-Bergen Jr./Sr. High School welcomes the public to a panel discussion about the nation-wide opioid epidemic. The event features experts in the field of addiction, as well as an opioid addiction survivor. This event is free and open to the public. Panelists will discuss recent developments regarding the availability and danger of opioids and will address audience questions. The panel will be moderated by GCASA Executive Director John Bennett and Assistant Director of Prevention Sherri Bensley. Additional panelists include Allison Parry-Gurak from the GOW Opioid Taskforce, Byron-Bergen Student Resource Officer Matt Butler, Prevention Educator Gina Henry, and a guest speaker with first-hand experience overcoming opioid addiction. 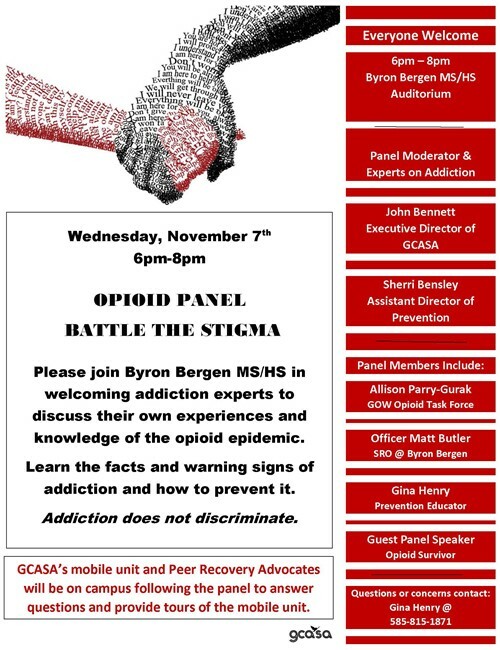 The panel is hosted by the Byron-Bergen Central School District and conducted by the Genesee/Orleans Council on Alcoholism and Substance Abuse (GCASA). It will take place Wednesday, November 7, 2018, from 6 p.m. to 8 p.m. in the Jr./Sr. High School Auditorium located at 6917 West Bergen Road, Bergen, NY 14416.